Take a look at the photo's from our recent install at East London based, Forever Beta's new office space. We think our planting scheme has really made this space sing! Our brief was to 'green-up' Forever Beta's new office space and add some tactility. The blank canvas of a pared back, industrial warehouse with exposed services was a great start. Our key planting elements complement the industrial style in their metal simple forms. We also added a nod to Forever Beta's signature red logo in the use of red rope for hanging planters. Our design is made up by 4 key planting elements. We love the versatility of these planters. With the ability to hook onto one another, you can create a pillar of greenery, or a singular basket of green beauty. A mix of trailing plants work well in this planter since it adds to the overall vertical hanging effect the planters have. We used Vinca minor, Hoya linearis, Tradescantia zebrine, Asplenium scolopend, and Philodendron scandens. We positioned the hanging pots in key locations to frame spaces, such as by pillars or to frame the tea point. Adding planting to the ceiling area is a great way to achieve maximum greenery impact. Often office spaces are so fully occupied with furniture and people that a pot plant easily goes a miss. Raising the plants towards the ceiling helps them get noticed. We designed a series of trays to hang from the signature Forever Beta red rope from the ceiling. Similar to the hanging pots, the trays helped frame the space and added an industrial element to the existing exposed services of the building. We planted Cissus rhombifolia and Ellen danica . These vintage bottle bins are a great find, a brilliant creative reuse for planters. They are on castors meaning they can be moved around the office space. 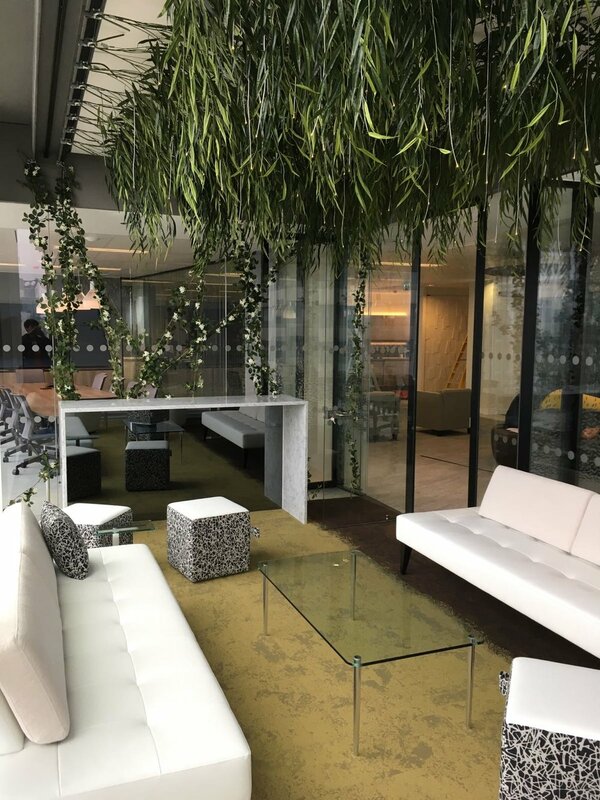 The substantial metal planters and plants that will continue to fill out, create a visual and acoustic barrier in the office space. The mix of tropical type plants which are great for indoor use were; Epipemnum aureum, Phlebodium 'Blue Star', Alocasia x amazonica, Tradescantia zebrine, Aspenium scolopend Crispa, Howea foresteriana, Zamioculus zamiifolia. 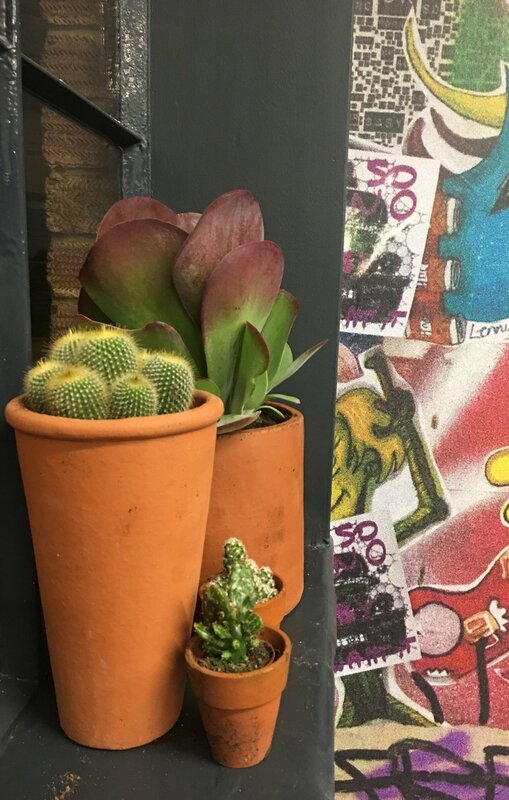 In Forever Beta's new darkly painted boardroom, we chose terracotta planters and a mix of cacti and succulents to give the space a desert like feeling. We particularly love the giant cacti that stands proud and majestic central boardroom. Using the window cill for lining up the mini cacti and succulents means the sun entering on these beauties will fuel their growth.